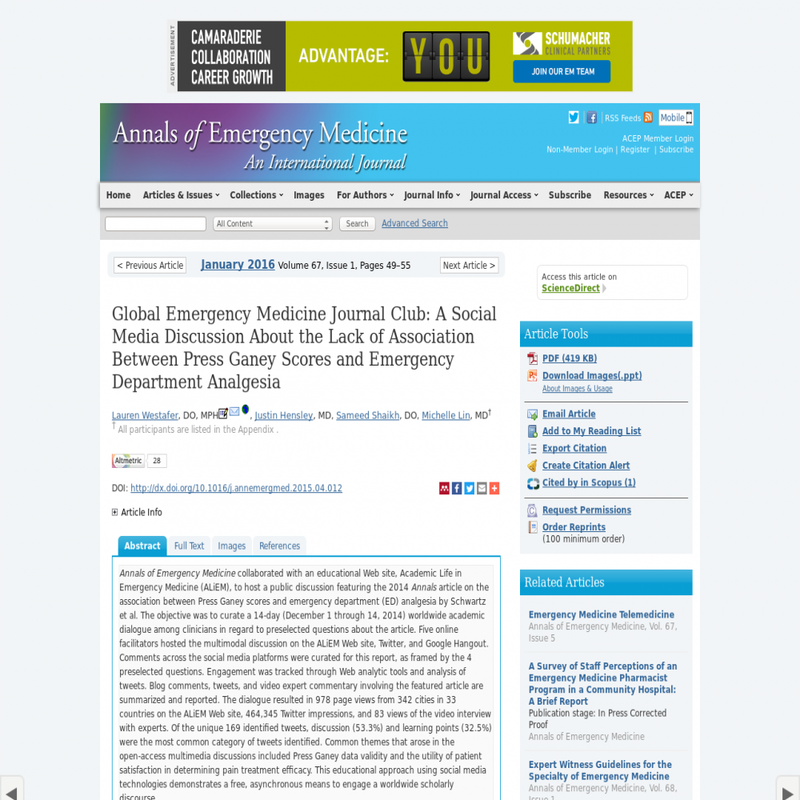 Annals of Emergency Medicine collaborated with an educational Web site, Academic Life in Emergency Medicine (ALiEM), to host a public discussion featuring the 2014 Annals article on the association between Press Ganey scores and emergency department (ED) analgesia by Schwartz et al. The objective was to curate a 14-day (December 1 through 14, 2014) worldwide academic dialogue among clinicians in regard to preselected questions about the article. Five online facilitators hosted the multimodal discussion on the ALiEM Web site, Twitter, and Google Hangout. Comments across the social media platforms were curated for this report, as framed by the 4 preselected questions. Engagement was tracked through Web analytic tools and analysis of tweets. Blog comments, tweets, and video expert commentary involving the featured article are summarized and reported. The dialogue resulted in 978 page views from 342 cities in 33 countries on the ALiEM Web site, 464,345 Twitter impressions, and 83 views of the video interview with experts. Of the unique 169 identified tweets, discussion (53.3%) and learning points (32.5%) were the most common category of tweets identified. Common themes that arose in the open-access multimedia discussions included Press Ganey data validity and the utility of patient satisfaction in determining pain treatment efficacy. This educational approach using social media technologies demonstrates a free, asynchronous means to engage a worldwide scholarly discourse.